After a few early messages, I usually get a sense of a person. Yes I could be very wrong about them and it can all turn pear-shaped quite fast but that early impression counts for a lot. We get chatting; sharing stories and interests, learning all about each other and that’s when it kicks in. Hope. Regardless of how many times I’ve had this feeling before or how many times it’s been misplaced, it inevitably returns and with it comes a bucket load of confusion. Today I’m slap bang in the middle of the hope phase. I’m loving and hating it in equal measure. Yes, it’s exciting getting to know him and I’m having lots of laughs but nestled in the back of my mind is that this is not real, and it can’t be real until we meet. Essentially I’m refusing to trust my own judgement of our conversations. What if he’s nothing like I’ve imagined? What if I’m an awful judge of character? What if he’s simply really good at telling me what I want to hear? A consequence to that is that this can put a lot of unnecessary pressure on a first meeting. Wasn’t it so much easier when we met in real life first? Texting with people we already know is fine but texting strangers is fraught with doubts. 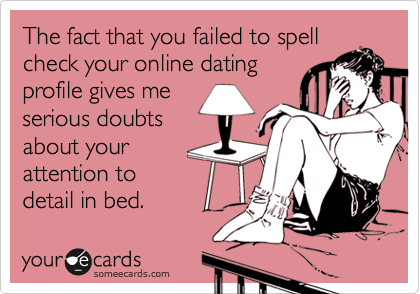 Maybe it’s because I see so many obvious catfish online that I’m wary of anyone who seems too good to be true. Of course it could be fine and it’s probable that I’m just overthinking it; nothing new there. I used to be quite blasé about first dates, and mostly I still am. Once in a while though you find one that you’re really hopeful about. Who knew that hope and excitement was so stress inducing? I’m sure we’ll meet in the next few days, wish me luck! I recently went speed dating for the first time. With no idea what to expect, I wasn’t at all nervous. It was to be a fun night out with a friend, an unusual event to talk about over the water-cooler tomorrow. Upon entering the venue it quickly dawned on me that I was meant to arrive with a sales pitch to a very unnatural setting. I’d forgotten I was going to need to be at my best, my easy smile wouldn’t win it for me today. What would I say? How would this go? Just how awkward is an awkward silence with an awful match? If you’ve never been speed dating, it’s like tinder but with paper and pencil. You make a list, put a tick beside any you’d like to see more of, submit to the organisers and if mutual ticks are had then you can swap contact details. We got down to it. The men were seated and the women were to move to a new table every 3 minutes. We had to do the moving about? It felt we were being judged. I’d naively thought that I’d be doing the judging. I really hadn’t thought this through at all. Never mind the fact I’d worn heels and was guzzling wine like it was the end of days. I was sure to fall over shortly. The Professional Conversationalist: He asked lots of questions, I suspect he’d them written up his sleeve and his biggest fear was any moment of silence. It felt very unnatural, forced even, there was no flow to the conversation. This wasn’t a great start. The Farmer: Bless his cotton socks, he was a stereotypical farmer from 1982. He was sweet and shy, and he wanted a nice sweet girl to take home to Mammy. Daredevil: I have no memory of this date. I strongly suspect I wasn’t blown away by any of it. Flake: Ah! I’d met the Flake on a date before. He’s great fun to chat to so I knew this would be easy. The reason we’d never had a second date was because he was a complete flake. Great fun but not reliable or attentive and no idea where he wanted to be next week, never mind 5 years. The Prof: Not normally my type. I’d have swiped left if I saw him on Tinder but I was pleasantly surprised. He was fun and insanely intelligent. I ticked the box to match with him. Quiet: Rob was a very sweet kid. He was terribly shy and quiet. I don’t think I’ve ever had a more difficult conversation. When he did speak, I could hardly hear him. He seemed very uncomfortable and this was certainly the wrong setting for him. The Gaelgoir: A nice guy, no spark, nothing in common, it was a hollow pleasant conversation. The Accountant: He was dull, in a stereotypical accountant kinda way. Not a bad looking lad but I fought falling asleep for the longest 3 minutes of my life. Good On Paper: I’d also met this guy before. In fact, I’ve written about him in Backwards. He was good on paper, tall, clever, interesting, ambitious, nerdy. There was just no spark at all. He’s the kinda guy I really want to see happy, just with someone else. The Pilot: Another dull conversation. He’d a nice smile but damn, that was a difficult 3 minutes. The Kid: Lovely guy, fun chat but I wondered what was the point of making any effort as he was all of 23 years old. Biscuits: He was sitting beside the biscuit table, and I do love biscuits within easy reach! Fun guy, good chat. I honestly can’t remember why I didn’t tick his box. Teacher: A hilarious Cork teacher. He wasn’t blessed in the height department so being seated was to his advantage when I ticked his box before seeing him stand. I was quickly reminded that what Irish men lack in looks and online pitch they more than make up for with charm, wit and an easy demeanour. They’re not suave or very good at selling themselves but they’re mostly great fun. An Irish guy’s best qualities cannot be accurately portrayed in an online dating profile and a few pics. Is it any wonder online dating isn’t working for me or them? More than anything though, what I enjoyed was the giggles had with the wonderful, smart and fun single women that were also in attendance. Take a bunch of strong single women, add wine, an awkward scenario and the result is giggles, warmth and fast friends. It was the best fun I’ve had since I last saw Dylan Moran live. I highly recommend it as an evenings entertainment.